India U-15 gear up for 'demanding challenge' in South Africa! 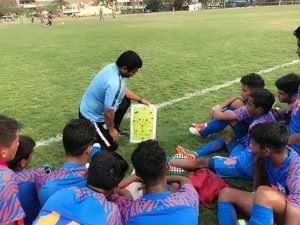 Home / International Football / Africa / India U-15 gear up for ‘demanding challenge’ in South Africa! “Keeping an eye on this and other upcoming demanding games, we created similar situation for our players and played a couple of matches with higher age group teams like Indian Arrows, U-18 Tata Football Academy, Odisha Santosh Trophy team respectively,” he further stated. “A big thank you to the Odisha state government for providing us with state of the art facilities which has helped to nurture the youth teams. From theground, to the sports science centre, gym, swimming pool, etc, every facility at the Kalinga Stadium is top notch and it has helped create a sense among the boys that they are being taken care of in the best possible way, and are part of something big and important,” he said. Previous VIDEO: ISL champions Bengaluru FC visit JSW Headquarters! Next Chennaiyin FC to play their AFC Cup group matches in Ahmedabad!